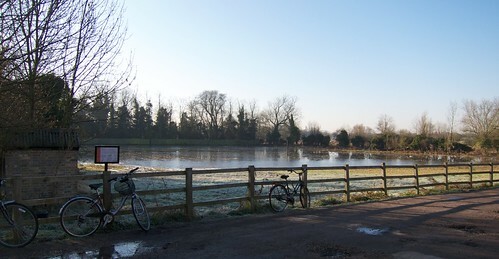 Just around the corner from my house, where the footpath from Cambridge to Grantchester begins, is Skaters’ Meadow. In the 19th century, the meadow would flood, freeze, and people would pay a penny or two to skate around the lamppost in the middle (which you can just see if you click it and look at the larger versions on Flickr). Wouldn’t it make a great setting for a story, though? More photos of the meadows here. I don’t know about competing with Rose, but you do seem to be channelling M R James (perhaps appropriately enough, given your location). Lots of interesting info, as ever. Apologies for being O/T again but also dropped in to comment on the first volume in Rose’s fictional series, which I’m just finishing. Tried her site, but a bit daunted by the log in process – ie = private? Anyway. The book’s a very entertaining and absorbing read. It’s written in elegant prose and goes at its own, comfortable pace (a perfect match for the period setting! ), ensuring from the start that the reader is provided with a strong sense of time and place. I love the deft fashion that Rose marshals what could be irksome amounts of detail, making it enriching rather than distracting. In this manner, she brings to life not only people and places but also the politics & social structure of the day. Each character is clearly delineated, fleshed-out as it were, and the fact that the POV (an ‘omniscient’ one, technically speaking) shifts contributes depth as well as irony. There’s a fair bit of humour, which arises naturally from character/events – just as it should. Only cavils are minor ones, eg an ‘I guess’ creeps in and jars a bit. A good copy editor would have picked this up; but good copy editors are mostly unemployed, these days … And the cover reeks of Victoria Holt: what on earth is a comparatively mature, early 1960s model doing sporting an early 1970s ballgown on what looks suspiciously like Beachy Head? The White Cliffs of Suffolk …! But I know authors have no say in the packaging of their own products – more’s the pity (they are the brand owners, after all). Bon weekend to you, Rose – and Tilly, of course! Hi Minnie – thanks for the kind words! I share your concerns about the covers – they’re quite striking but I don’t think it’s Mary Finch. And actually, the problem with the dress is not that it’s 1970s but that it would be valid, if I remember rightly, for something like the 1770s, and not for the 1790s, by which point they were looking much more Pride and Prejudicey. Rose also complained that Mary would not have possessed such a dress before gaining her fortune, and in the immediate aftermath she would have been in some degree of mourning anyway… so certainly wouldn’t have been wearing that colour. But one can only protest so much. And they did, for example, take Rose’s advice on a proper 18th-century typeface for that edition. Ah, yes, Quentin – and spot-on: the dress should be Regency-style pre-Waterloo, and Mary should indeed be in mourning. I understand Rose’s irritation. Why can’t we have a bit of historical accuracy? Doesn’t cost any more … harrumph! Shall look forward to the French-flavoured third in the series; have just ordered the second one. Now I have finally noticed Rose’s email address (duh!) on the front page, I can send any further reviews/comments direct. In the meantime, thank you for your patience – and bon courage for the blogging!